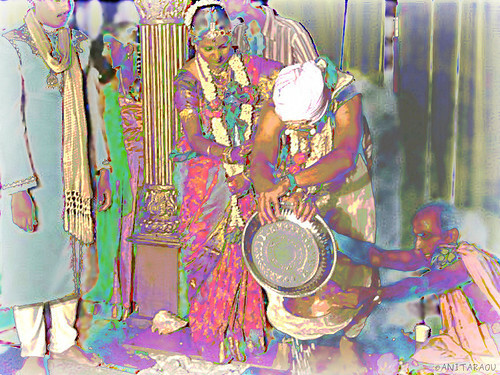 I applied some blurring and solarization effects to the photograph, mainly because it was a slightly old, low-resolution image with not-so-great colors, and also because it was fun playfully distort the picture while still maintaining the spirit of the ceremony. Distorted picture or not, the bride is the most eye-catching person at a wedding! This entry was posted in People and tagged Photography, Processing, SL-week, Solarization, Tradition, Weddings. Bookmark the permalink. And I like that you like it, Sylvain!